Courtesy of the Grant County Historical Museum. When the Great Northern built through the Big Bend area in 1892, 100 miles was considered an average trip, and crews were able to get over that distance in one shift. As such, about 100 miles from Spokane was Wilson Creek. Crews' pay was also based on 100 miles. All you got for going that far was one day's pay- but if the trip was over 100 or some special chore awarded you some additional arbitrary miles, the pay for your trip increased. An intermediate terminal was built there, so trains could be switched around, locomotives could be serviced at the roundhouse, and crews could be changed. 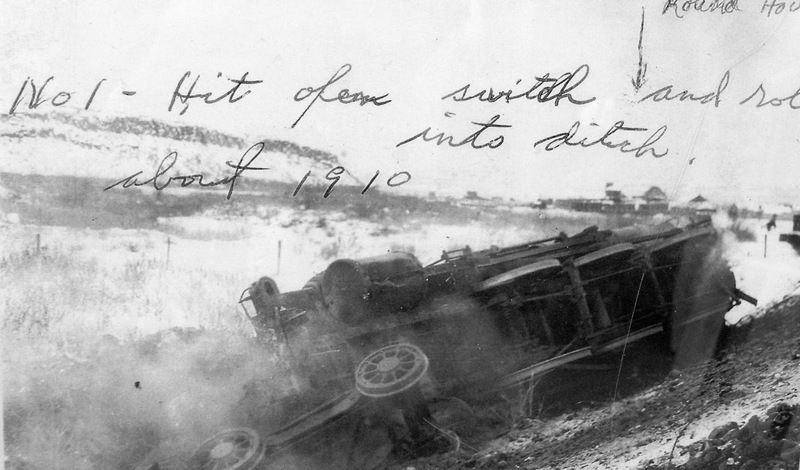 This wreck looks like the crew was expecting the switch to be lined one way, and were travelling fast enough that when they took the switch the wrong way, the locomotive was flung from the tracks.